Customers of the Royal Bank of Canada can now perform money transfers with Siri, with an update to the bank's mobile app for iOS adding the ability to make payments from their checking accounts to individuals and companies using a verbal command. 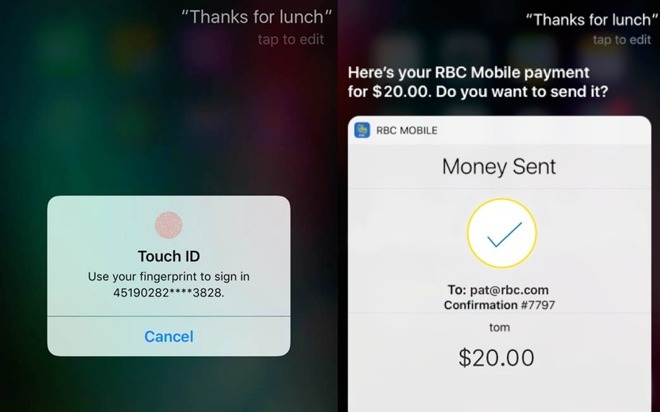 In the update released on Tuesday, the RBC Mobile app's Siri integration allows the account holder to start a transaction by triggering the digital assistant and asking to pay, such as "Hey Siri, send Pat $20." A follow-up screen confirms the person on the payee list the user wants to pay, as well as the amount, with TouchID also used as a security measure to prevent misuse. The transaction is then completed by RBC deducting the funds from the customer's account, before sending the payment to the requested recipient. "It's our goal to continue to be part of the everyday mobile experience of our clients by adding more convenient and seamless ways to send money and bank with RBC," said Sean Amato-Gauci, executive vice president of Digital, Payments, and Cards in a statement. "Building on the explosive growth of our free person-to-person payments products, we're excited to provide the ability for our clients to now send free money transfers from their chequing accounts using Siri. While RBC is the first Canadian bank to offer Siri-based transactions, the function has been available to iPhone users for a few months, after Apple officially opened up access to its Siri APIs to third-party developers. PayPal started offering its users payments through Siri in November last year, while PayPal subsidiary Venmo was one of the first to use SiriKit, providing the same function to account holders.